On Your Mark. Get Ready Italy! With just a week to go before my trip I’m scurrying around trying to get last minute details finished and tucked away. So much to do. Of course I’ve left all the disagreeable things about traveling to the last minute. After all, who really likes to call the credit card companies to alert them you will be out of the country? I don’t really like talking to automated telephon e systems and hate typing in my credit card number…. only to be asked for it when the next available operator takes my call. Over the last week I’ve been getting the lists of “must do’s” and “want to do’s” put together….with the help of my marvelous Facebook friends. One in particular, Judy Witts Francini, has been so helpful and has endured many of my question sessions. Thank you Judy!!! 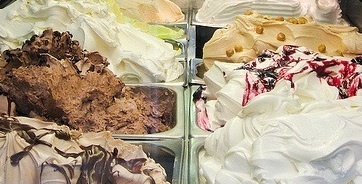 Last week I discovered that the Firenze Gelato Festival will be going on while I am there. Could anything be more perfect? I think this makes up for the disagreeable things I’m taking care of this week. Don’t you?